Merry and Bright Red and White Christmas Tree - Lovely Etc. As much as I love all kinds of Christmas decorating, there is absolutely nothing as magical as the Christmas tree. This year I kept things pretty classic with our pretty red and white Christmas tree. 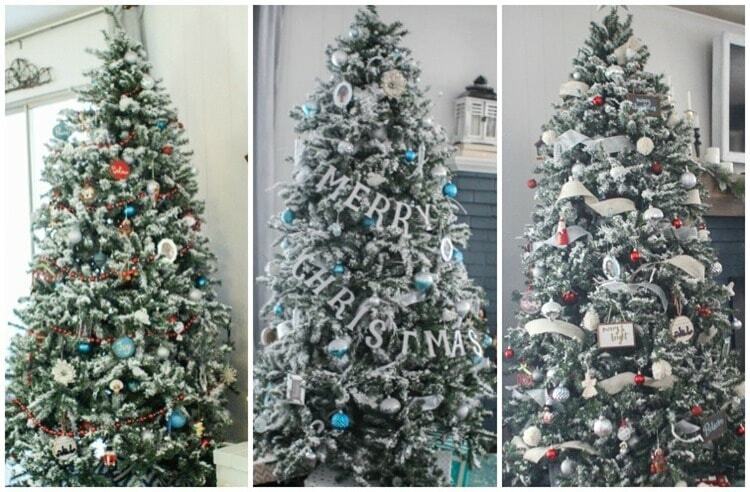 And I’m really excited to be teaming up with some other fantastic bloggers who are also sharing their Christmas trees. 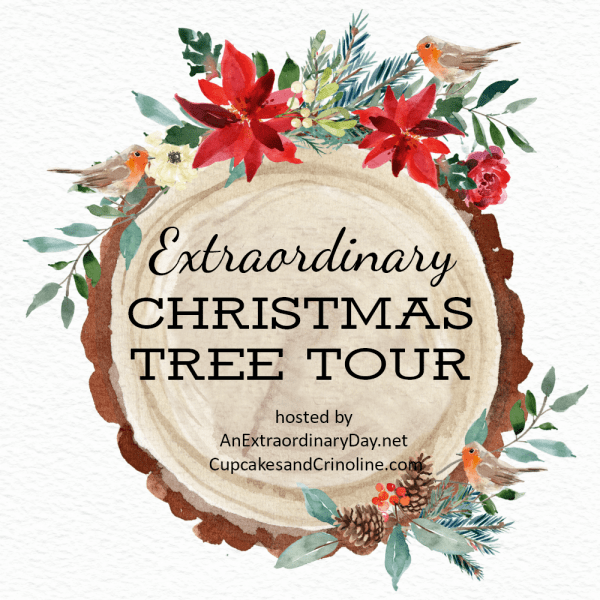 When Diane from An Extraordinary Day invited me to join in with a group of bloggers sharing their Christmas trees, I was all in. Because I love seeing other people’s homes and I love seeing how other people decorate. But most of all, I love seeing other people’s Christmas trees. There are just so many ways to put a great tree together! You can see how everyone else does it at the end of this post. We have an artificial tree that honestly may not make it one more year. We’ve had this tree for over ten years now so I’d say it’s lived a good long life. I’ve helped it along over the years by cutting off the attached lights when they stopped working. And I added flocking a few years ago which was a huge improvement. But even so, the branches are getting droopier and droopier – in fact most of the bottom row is actually touching the ground at this point. Luckily, I’ve learned a few tricks to make any tree look gorgeous – even an old, broken down tree like this one! When I was growing up, our Christmas trees didn’t have themes or color schemes and they were most definitely more ‘festive’ than beautiful. I have so many happy memories of pulling out the same colorful ornaments each year and hanging them on the tree. Including gaudy ornaments we made at school, my favorite Care Bears ornaments, and Christmas balls of all colors and sizes. My great grandmother’s tree on the other hand was perfectly coordinated each year with red and gold balls and bows and no other ornaments. I always thought it was pretty but kind of sad that the ornaments weren’t personal at all. It’s taken me a few years, but I think I’ve landed on the perfect combination of meaningful and beautiful for our Christmas tree. Each year I decide on a color scheme for our Christmas tree. A couple of years ago I did red and aqua, last year was blue and white, and this year I went classic with red and white. I add all of our Christmas balls in those colors along with some ribbon. And then I pull out all of my favorite ornaments and add them as well. All of the colorful balls set the tone for the tree and there’s still plenty of room for our fun handmade and vintage ornaments and all the memories they hold. Christmas lights are simply magical and I love a Christmas tree to be covered in lights. I have two favorite tricks for a tree that glows – use two sizes of lights and wrap the lights around every single tree branch. Personally I am a white Christmas tree lights kind of girl and I use regular lights as well as these pretty marble sized pearl lights. Another total game changer is this special Christmas tree extension cord. If you don’t have a prelit tree, you have got to do yourself a favor and get one of these. 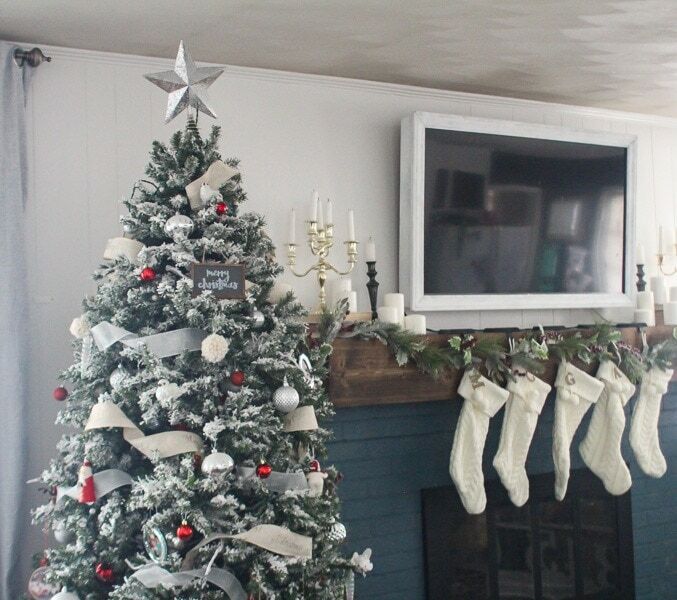 The cord goes up through your Christmas tree along the trunk. You can easily plug all of your strands of lights into it and then there’s an on/off switch at the bottom of the cord! You can leave it plugged in and just tap the switch on or off with your foot! So much easier. Some kind of ribbon or garland really helps pull a Christmas tree together. This year I used some shimmery white ribbon as well as gold linen Merry Christmas ribbon, both from Michael’s. There are lots of different ways to add ribbon, but I like to add it horizontally. And I cut my ribbon into small pieces and tuck them into the tree to make my ribbon go further. One of my favorite things about a flocked tree is how gorgeous it looks even when the lights aren’t on. I’ve written before all about how I flocked our old tree so I won’t go into it here. But I will say that it made a huge difference in helping our tree last as long as it has. I haven’t touched up my DIY flocking in two years, but it still looks beautiful. One of my personal Christmas traditions that I love is making a few new ornaments to add to our tree each year. Our handmade ornaments are always some of my favorites. This year I added these mini wooden signs. 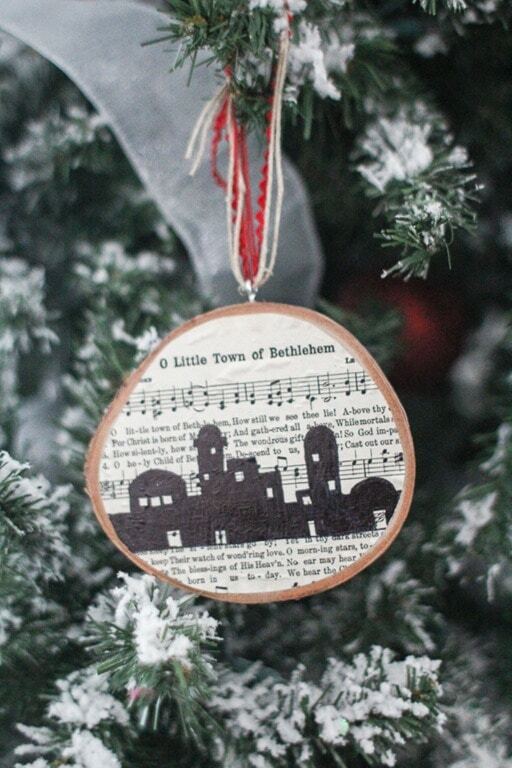 This O Little Town of Bethlehem ornament is a favorite from a few years ago. This year I also added a bunch of white yarn pom-poms and they add such a great texture. (Plus they’re totally toddler-proof. Always a plus around here.) If you’ve ever thought about making your own pom-poms they are super easy to do – I’ve got a great tutorial for you right here. My grandma also had one of those coordinated trees, and it was never my favorite. I love that you’ve found a way to combine the designer look with meaningful, handmade ornaments. Beautiful tree! Thank you! It feels like a great solution! 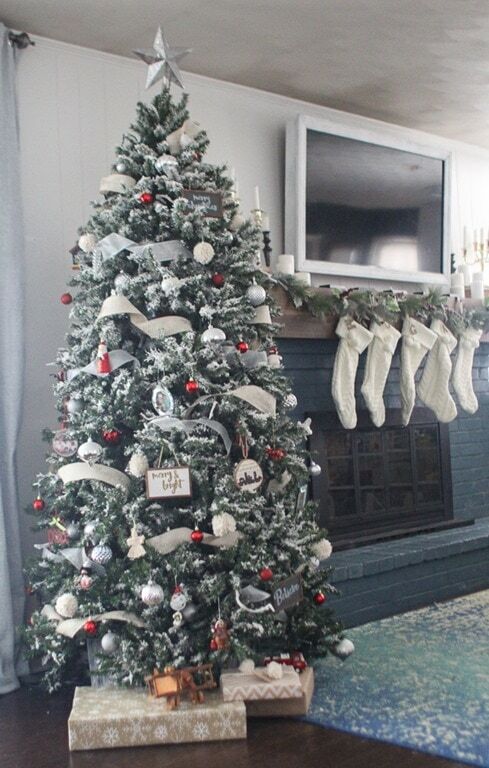 Your tree is beautiful, love the pops of red mixed with the white flocking, so pretty! So pretty. I love the color combination and the simplicity. Thank you Lorena! I’m definitely seeking some simplicity this year! Absolutely Gorgeous! 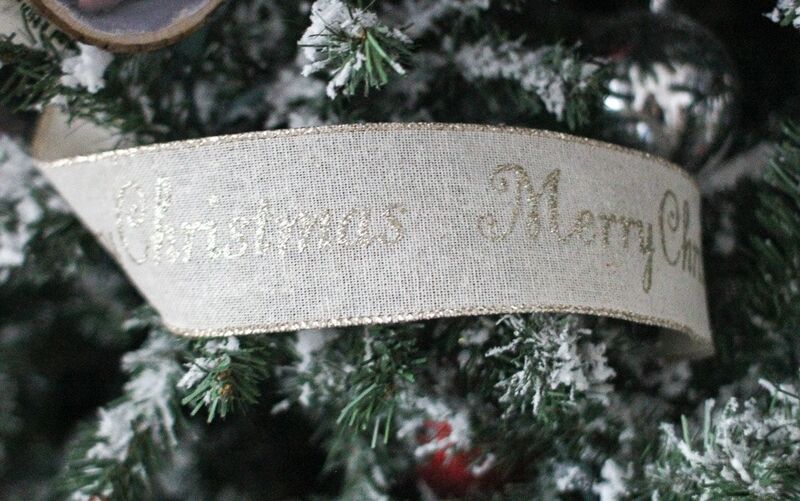 LOVE the Merry Christmas Banner and all those cute details. It feel so spacial! Lovely. I haven’t had the courage to flock my Tree. I don’t know I’m scared to screw it up I guess. BUT I love how yours look! Great job! Thank you! 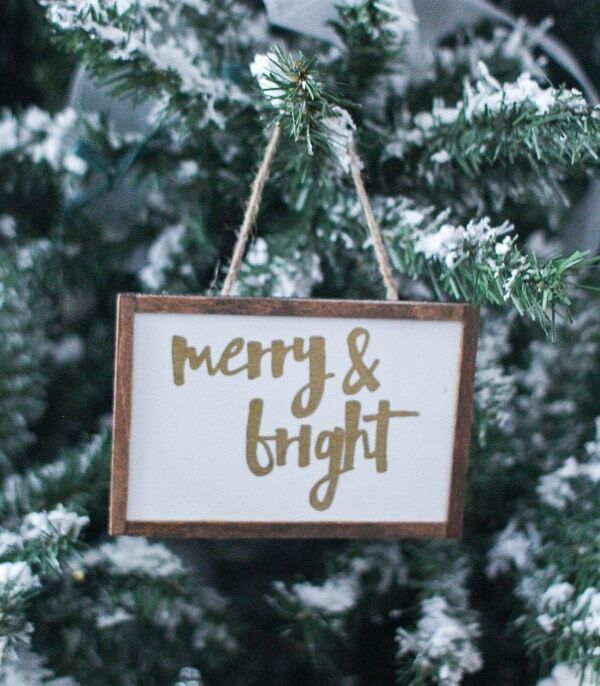 And you really can’t mess up flocking – you just basically toss it all over your tree, lol. 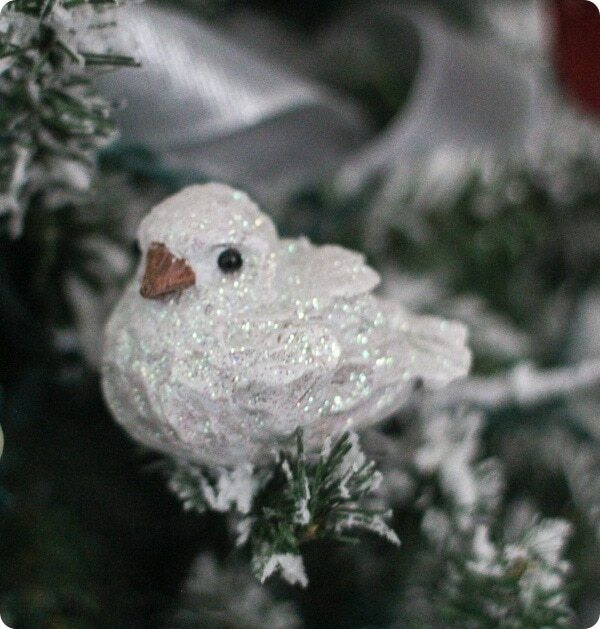 What an absolutely beautiful tree…and I just LOVE that you flocked it yourself! I love your style. But, you know that already. Your simple tree is stunning with a modern touch. Thanks for sharing, Carrie. It is always fun to visit your blog. Thank you so much Meegan – you are the sweetest. Your tree looks beautiful! 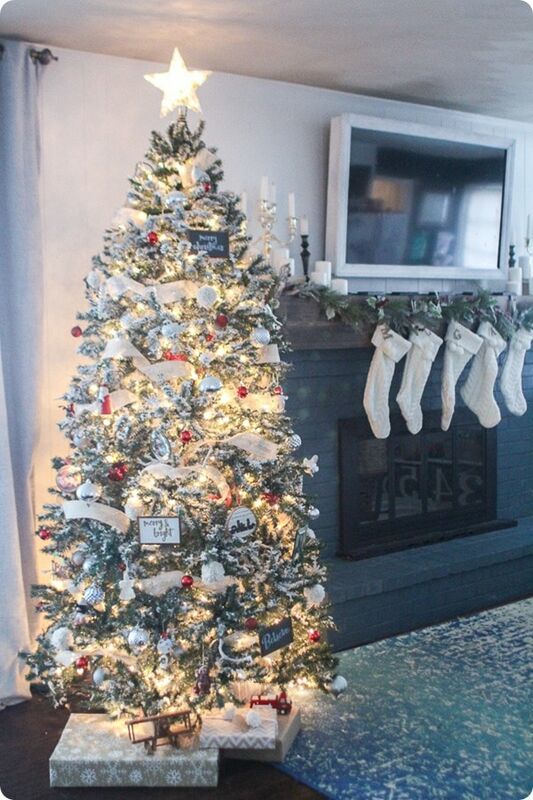 I love the ribbon that you selected for this year and plan to use your tip for cutting it into smaller sections when I decorate my tree next year. You’d never know that this tree is ten years old from the pictures. It looks marvelous! I’m also rocking the red and white theme and I’m loving it! I like that picture of the three trees, they all look beautiful. Merry Christmas to you and your family! Thank you Cristina! Merry Christmas! I love your flocked tree Carrie. I have to read that post. The red and white theme is beautiful too! Gorgeous!! Carrie, someday I’m going to follow your tutorial and flock a tree. I so love the look. Sometimes the green seems so dark and your ornaments are so showy against that snowy backdrop. I’m so blessed to have you joining us for the tour as well as the 31 Days!! Thanks Diane! Now that I flocked my tree, I can’t imagine having a regular tree again! Your tree is beautiful, Carrie! I was going to flock my tree this year using your instructions but I didn’t and now I’m kicking myself! Hopefully, next year I’ll remember and do it in October so it’s all ready. Definitely try it next year Mary Beth! It is really easy but they do usually sell out of the flocking so buy it early!